I was so very excited to find out about this book by Katie McGarry. Not only is she a favorite contemporary author of mine, but I absolutely love her characters, their stories, and the relationships she develops between them. 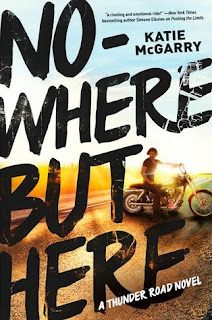 When I saw she was writing about a motorcycle club, I have to admit I was REALLY excited. My Dad is a Harley rider, so I love going out on the bike with him and seeing the unspoken camaraderie between bikers. I've only read one other book about what it means to be in a motorcycle club, so I was curious to see how McGarry would handle it. I thought she did a great job overall. There was some confusion at the end about some of the politics and dynamics between the rival clubs, and I remember discussing with a few close bloggers friends (Who I buddy read this with!) so that we could try and get our heads wrapped around as to how everything transpired. This was a minor issue in comparison to the novel as a whole. I really enjoyed this one so much. Even though it's a longer book, I didn't feel that length at all. I was wrapped up in Emily and Oz's stories, their romance, and the amazing family dynamic McGarry has created. I adored Emily and Oz's relationship. Oz is less than thrilled about Emily being around. He sees her as an outsider and does not want her to ruin his family. (Everyone in the club is really close to one another and Emily's grandparents had taken care of Oz for a bit while he was younger.) He's incredibly loyal and protective and those were two things he was to a fault. Even though he didn't particularly care for Emily, he still took care of her out of obligation. Then, it became out of want and necessity. I love seeing that change between them. These two had so much chemistry and while I was a little disappointed she didn't take them to the next level, I definitely liked that Oz was so patient with her. I was a little worried, given his reputation, but he was pretty dedicated to her, even when he was saying he wanted to get her off his mind. I also enjoyed the suspense in this book. 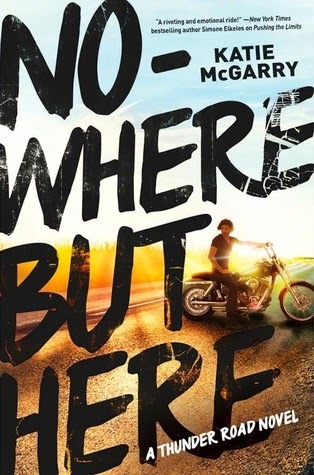 There are a lot of family secrets about Emily's mom, dad, the motorcycle club that I was dying to find out... and we don't until almost the very end. I have to admit I was a bit brokenhearted about a few of the secondary storylines because they were so bittersweet and I wanted them to end in a different way. Alas, it was not meant to be. I am really looking forward to reading more books in this series. Oz's friends, Razor and Chevy, will be interesting to read about for sure. Especially Chevy as we get hit in the face with quite a bit of drama between him and Violet, who used to be super tight with the boys as well. Seeing Emily transform from a sheltered girl to one who has her eyes firmly open was one of my favorite aspects of this book. She realizes she has a family in Eli, Olivia, Cyrus, and the others and it really warmed my heart to see just how much this family took care of one another. It was nice to see such a unified family for once, instead of the broken ones we are used to seeing in Young Adult. I thoroughly enjoyed this one and I am definitely excited for more because I just had such a deep love for these characters! I'm really excited to read this one! The motorcycle aspect sounds really cool, I haven't read much about them. They definitely have a sense of camaraderie and loyalty among them. The romance seems adorable. Lovely review, can't wait to check this one out! I'm so glad you enjoyed this one, Jess! I'm glad we buddy read this one because it was a lot of fun. I really liked Emily and Oz as well and the whole family aspects. I do agree that the whole motorocycle club thing did get a bit complicated towards the end. I'm really glad you loved this one so. As you know, I struggled with a lot of aspects of it, but I still love Katie McGarry and I definitely want to read Razor's story. I am reading this hopefully this weekend and I so cannot wait! I just know I am going to love it. Great review! Okay, Oz sounds completely SWOOOON-worthy! Great review, Jessica! I loved Oz and Emily's relationship too - it was a nicely done slow burn with a side of love-hate. Katie is always great with her romances! I have never read anything by Katie McGarry but this book looks really good and I'm glad you enjoyed it!! This is on my TBR, but who really knows if I would have ever gotten to it with the screaming pile that it is. Thank you for your great review. I will definitely be sure to read it. I still haven't read anything by Katie McGarry but I feel like I'm really missing out! Maybe I should start with this one, because I'm very intrigued about motorcycle clubs!